Most physical illness effects people at the extremes of life, particularly in late life. A significant proportion of hospitalized older patients will experience some mental health problems, and medical units lacking specialist old age psychiatric services must rely on adult psychiatric and consultation liaison services for support. These generalists assume the role of old age psychiatrists by default. A key aim of the book is to provide guidelines for the appropriate treatment of psychiatric disorders in older people when medical illness complicates the picture. The book is divided into five sections. The first two sections cover the nature of the problem and initial assessment procedures. Section three focuses on specific disorders, including, amongst others, the most common reasons for referral - dementia, depression and delirium. Section four provides guidelines for treatment including pharmacological therapies, psychotherapeutic interventions and the use of ECT. The book concludes with short section considering the ethical and legal issues involved. 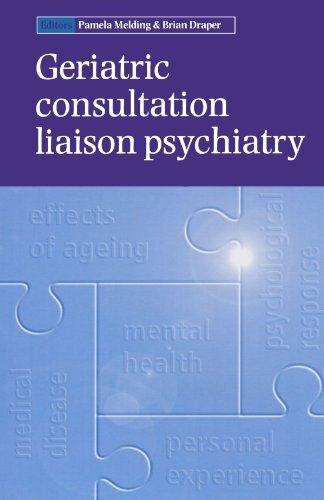 This book covers the theoretical and practical knowledge required by psychiatrists in training, those seeking to specialize in consultation liaison or old age psychiatry, geriatricians and general practitioners. It will also be of interest to all other members of the healthcare team responsible for the medical management of older patients.